In the Ukrainian community where I grew up, I spent countless hours watching the women in my family work what seemed like magic as they cooked delicious, unforgettable food. Over the years I learned some of their secrets and figured that one day I’d inherit the book that all these delicacies sprang from so I could learn the rest. As it turned out, though, there was no book—the recipes were inside of these women, and many were buried with them when they died. So, years later when I got a job cooking at the Warsaw Café in Philadelphia, I got a delightful reintroduction to the food I remembered. 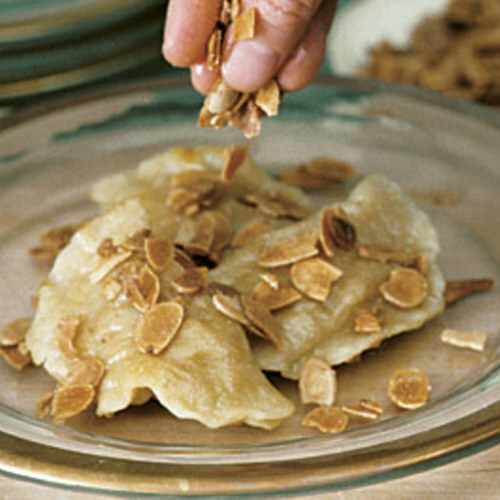 One of my jobs was making pierogis, the tender dumplings of my past, filled with potatoes, meat, or a dried apricot compote. Finally, the secret of pierogis was revealed to me. So here it is—for everyone else who never got a chance to ask for the recipe. 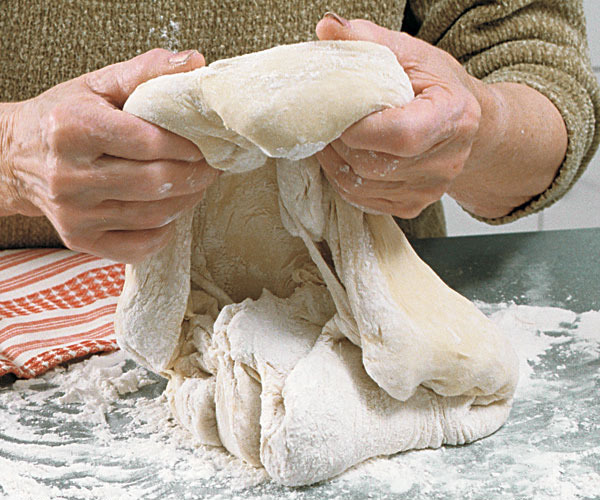 The most important factor in this dough is the fat that binds it because it also lightens the texture of the finished dough. Traditional Polish cooks use vegetable shortening, but Marie and I find that sour cream works wonders for a supple dough that’s firm enough to enfold a variety of fillings. 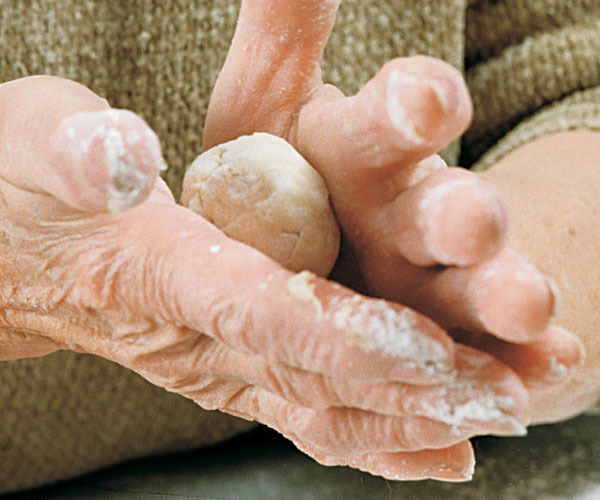 For the tenderest pierogi dough, knead gently. When I first started making pierogis, they came out a bit leaden and chewy because I was kneading the dough too vigorously. The gentle motion you’ll master is a kind of sequence: cradling the ball of dough with your fingers, lifting it up, and letting it fall out of your hands. This short knead—just two minutes or so, until the dough is smooth and slightly sticky—is followed by a 20-minute rest to let the dough relax. 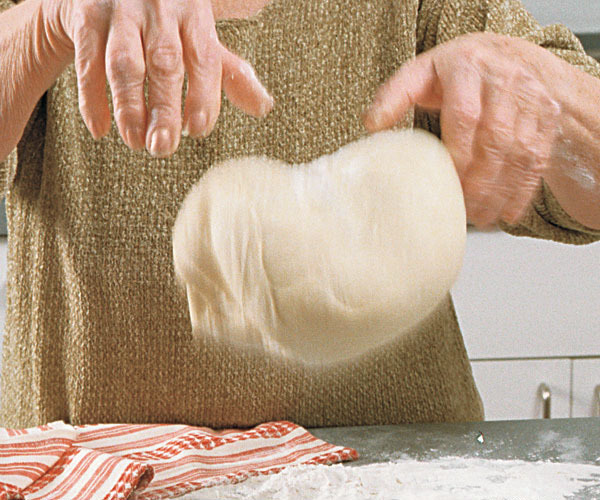 …and then dropping the dough on the work surface. Knead until the the dough is smooth and slightly sticky, about 2 minutes. 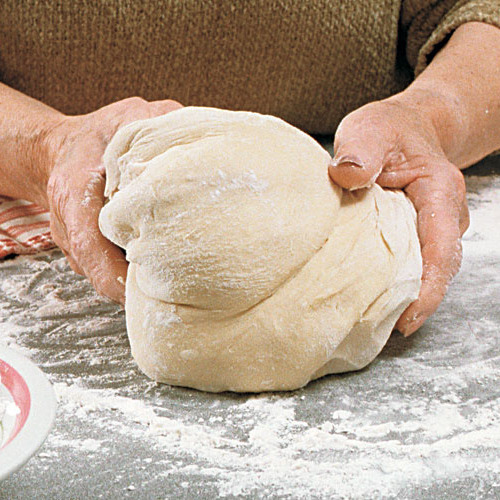 Roll dough balls into disks. You’ll pinch off about a tablespoon of dough and roll it into a ball that’s 1-1/2 inches in diameter (if in doubt, go for larger, which makes for easier filling). You’ll then roll the ball with a rolling pin into a disk that’s about 3 inches in diameter and between 1/8 and 1/4 inch thick. 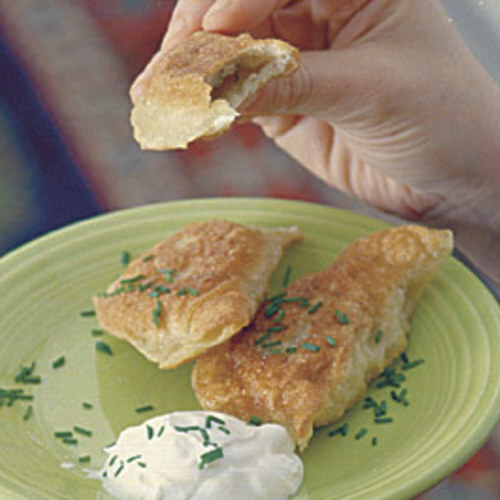 Some cooks roll out the dough and then stamp circles with a cookie cutter, but we find that you end up losing dough and then overworking the scraps, which results in a less tender pierogi. To stuff the dumplings, follow the photos with the recipe. 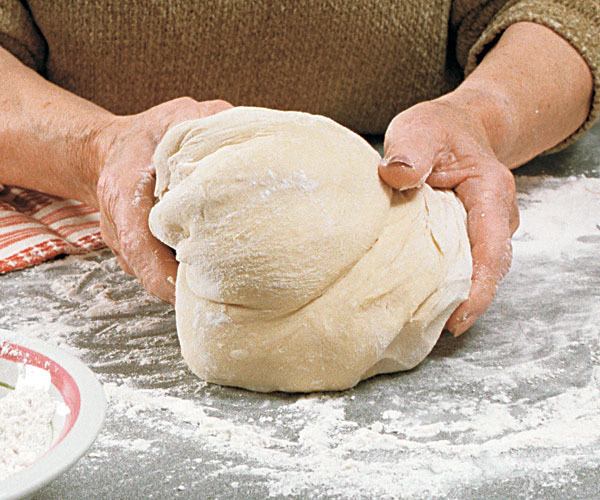 With lightly floured hands, roll the doughinto 1-1/2-inch balls. 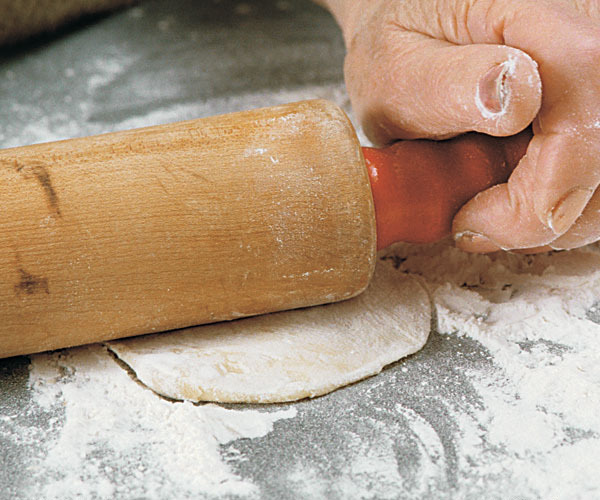 With a small rolling pin or a dowel, gently roll out each ball into a 3- to 3-1/2-inch round about 1/8 inch thick on a well-floured surface. 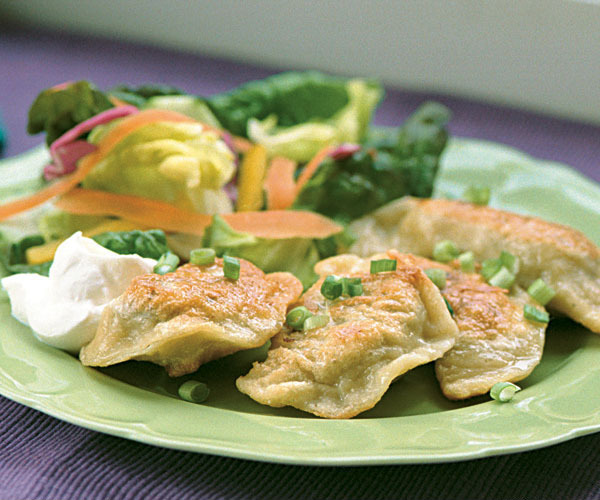 Once the pierogis have been filled, cook them right away or the dough will dry out and cook unevenly. When they float to the surface, give them two minutes more. Put on at least 5 quarts of water—pierogis need a lot of room to roll around—and bring it to a good rolling boil. Drop in the dumplings one by one, giving a gentle stir with a wooden spoon to make sure they don’t stick to the bottom or to one another. For puffy-crisp texture, sauté in butter. 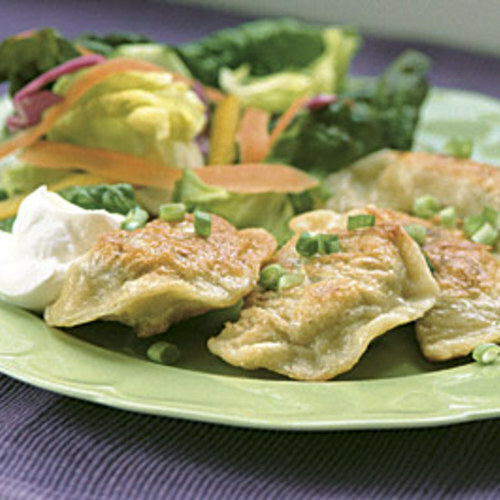 Simple boiled pierogis are delicious, but the meat and potato pierogis are especially good when they’re cooked a second time—browned to an even golden color in vegetable oil or butter, where they’ll develop a lovely puffy crispness. Then drain them on paper towels and enjoy. Nostroivia!